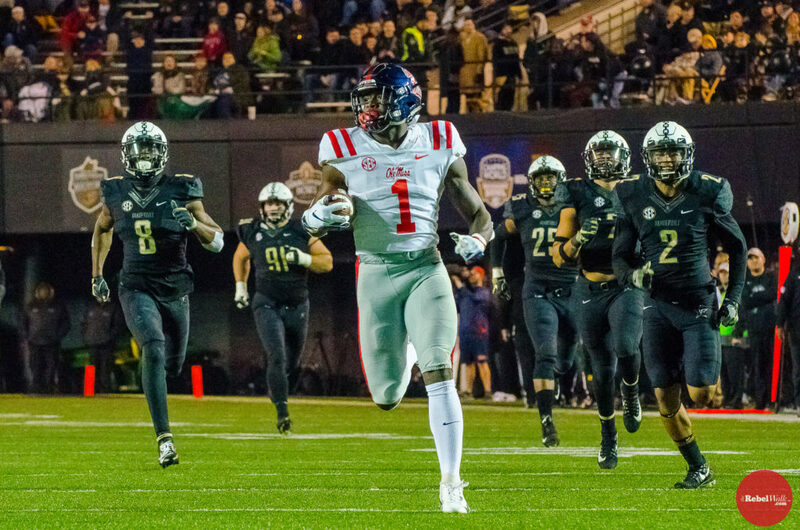 NASHVILLE — On a crisp, cool Saturday night in Nashville, Ole Miss suffered a gut-wrenching loss to the Vanderbilt Commodores, 36-29. The game was a story of missed red-zone opportunities—and bizarre calls by the referees. When you look at the stat sheet, the Rebels went 6-7 in the red-zone. Unfortunately, five of those were field goals. The Rebels scored one touchdown in seven trips in the red zone, and that was ultimately the difference in the game. That being said, these players fought tooth and nail and played their hearts out. 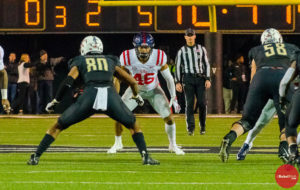 In the first quarter, after exchanging the opening two possessions, the Rebels drove down to the Vandy 15-yard line before ultimately being forced to kick a 32-yard field goal, one of five that kicker Luke Logan would hit on the night, giving Ole Miss a 3-0 lead. 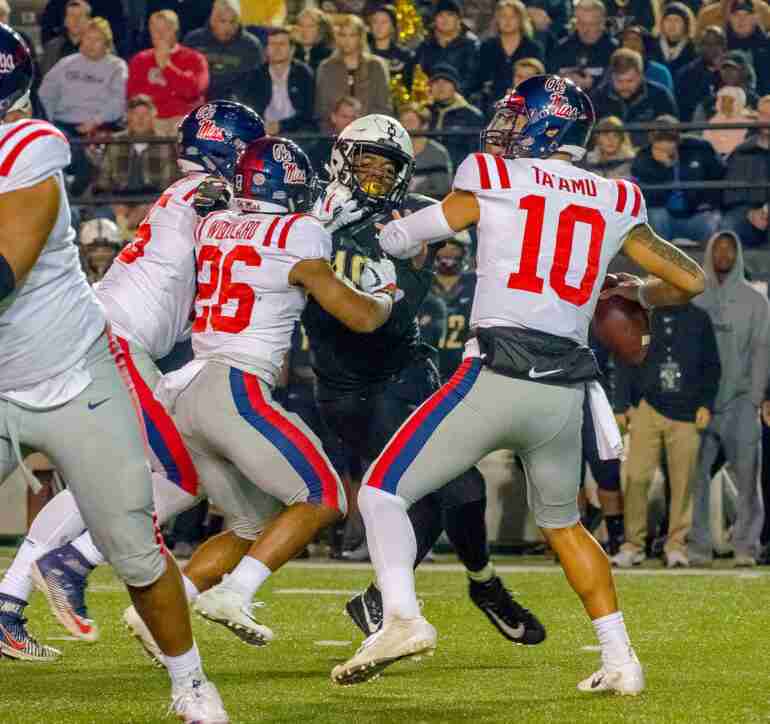 Another Vanderbilt three-and-out gave Ole Miss the ball back, and quarterback Jordan Ta’amu and company began a lengthy drive that extended into the second quarter. The opening play of the second period saw Ta’amu make a beautiful throw to senior wide receiver Floyd Allen to put the Rebels near the red-zone at the 23-yard line. The drive stalled and Logan came on again and gave the Rebs a 6-0 lead on a 20-yard field goal. An ensuing Vanderbilt punt then put the Rebel offense right back on the field at their own 16-yard line. Junior wide receiver A.J. Brown made defenders look silly while quickly putting the Rebels up 13-0 on the first play of the drive following an absolutely gorgeous 84-yard touchdown grab. On the ensuing Vanderbilt drive, however, the home team was able to pull 3 points closer as they hit a 37-yard kick with just over 5 minutes remaining in the half. They followed that with a block of an Ole Miss punt that was knocked through the endzone, giving Vanderbilt two-points from the safety. After the safety, the Rebs kicked to Vandy who, once again, received the ball in good field position. The Commodore drive, helped in part by four Ole Miss penalties, resulted in a 2-yard touchdown toss and brought the score closer at 13-12, which would remain the score at intermission. At halftime, Ole Miss had out gained the Commodores by over 100 yards. Ta’amu and his receivers had 240 yards and a touchdown through the air at the midway point of the game. Ole Miss kicked off to Vandy to begin the second half, and the Commodores quickly took the ball down the field via a balanced offensive drive that ended with a Ke’Shawn Vaughn 1-yard scamper into the end zone. That gave Vandy a 19-13 lead with just over 11 minutes remaining in the third. The Rebels took the ensuing possession down to the Vanderbilt 5-yard line before Logan was called on to make his third field goal of the game, narrowing the Vanderbilt lead to three at 19-16. Following the successful field goal, the Landshark defense fed off of the small bit of momentum and not only forced Vanderbilt to bring out the punting unit, but also pressured the punter into throwing an unplanned pass because of an impending block. The extra effort by the punt-block group gave the Rebels the ball back at the Commodores’ 26-yard line. Yet again, however, the drive fell short of a touchdown and the Nashville crowd watched as Logan put his fourth field goal through the uprights to even the score at 19 apiece. That stalemate did not hold for long, however, as Vanderbilt was able to drive down the field in the waning moments of the 3rd quarter and throw a touchdown that gave the home team a 26-19 lead. The Rebels began the fourth quarter with a drive that saw tight end Dawson Knox, who was suspended for the first half following a targeting penalty in the A&M game, make his presence felt on a 36-yard reception. He made the catch in between two Vanderbilt corners, and that set the Rebels up inside the Commodore 25-yard line. Unfortunately, Ole Miss couldn’t cash in as Ta’amu was picked off by Vandy safety, LaDarius Wiley. Vandy wasn’t able to do anything with the turnover and promptly returned the ball to the Ole Miss offense. Ole Miss then marched down the field on a 6-play, 90-yard drive that was capped off by an incredible one-handed touchdown grab by DaMarkus Lodge in the right side of the end zone. The game was tied at 26. Vanderbilt answered, however, putting together a long drive that ultimately stalled short of the end zone. A 44-yard field goal put the Commodores up by three, 29-26, with 5 minutes remaining in the game. Following an interception of Ta’amu at the Vanderbilt 33-yard line, the Ole Miss defense went on the field with continuous encouragement from the coaching staff. The unit forced a Vanderbilt punt that gave the Ole Miss offense the ball with just under two minutes to make something happen. The drive, starting on the Ole Miss 39-yard line, consisted of 11 plays, and the Rebels used just one minute of game time. A few shots toward the end zone that went incomplete led to the fifth Logan field goal of the game. He finished 5 for 5 on the night and the game was tied at 29. The Rebels’ defense held the Commodores from doing anything with 40 seconds left in regulation, so off they went to overtime. Overtime could simply be defined as tragic. Vanderbilt had the opportunity to be on the offensive side of the ball first, and they were able to take full advantage of that opportunity. Kyle Shurmur found Kalija Lipscomb for a 5-yard score that put the Commodores up seven, 36-29, as the Ole Miss offense took the field in a do-or-die situation. It seemed as if Ta’amu’s touchdown pass to A.J. Brown would lead to another overtime period. But it was not to be, as the call of a touchdown was overturned by the league office in Birmingham. A lot can be said about that hideous call. Rebels on social media were understandably shocked and outraged, and the SEC announcers were dumbfounded. No one seemed to understand why the initial call of a touchdown was overruled by the league office in Birmingham. I’m not sure anyone yet understands it–including Brown. 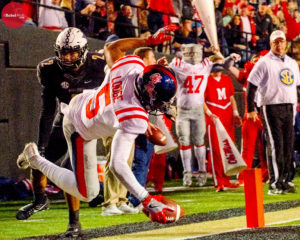 The ensuing fourth-down attempt fell short and the Rebels lost a heartbreaker to Vanderbilt, 36-29. Ta’amu finished with a career-high 457 yards with two touchdowns and two interceptions. Isaiah Woullard, starting for the injured Scottie Phillips, reached 100 yards for the first time in his career, tallying 107 on the ground. A.J. Brown notched an incredible 212 yards receiving on nine catches, while DaMarkus Lodge also caught nine and tallied 117 yards and a touchdown. Defensively, middle linebacker Mohamed Sanogo finished with 12 tackles, giving him 104 on the season. Nose tackle Benito Jones notched 7 tackles with two sacks and two tackles for loss. Outside linebacker Willie Hibbler tallied 6 tackles. The Rebels head home to face Mississippi State in the Egg Bowl on Thanksgiving Day at 6:30 p.m. It will be the final game in an Ole Miss uniform for many Rebels who are near and dear to our hearts. What’s the best way to fix a loss? Get back on the field and get a win in the 2018 Egg Bowl! Coach Luke was asked about getting his team ready to face State. “They don’t have any choice,” he said. “This is a huge game. They got to get up off the mat,” he added.